The UK’s vice-chancellors have published their delayed report into undergraduate student funding. Although the press release highlights a call for improved levels of maintenance support, the full report indicates that this is a priority if there is additional funding available. Given recent announcements about further cuts to BIS’s higher education budgets, this has the feel of an empty protestation particularly as the coded message of the report is to make graduates pay more rather than levy cuts on university budgets. By far the most significant sections in Student Funding Panel repeat Hefce’s recent concerns about the medium-term sustainability of university activities, given their current income and ability to generate surpluses, and then models how a freeze to the loan repayment and interest rate taper thresholds for several years after 2016 can bring the ‘RAB charge’, which covers the public subsidy on loans, down to ‘sustainable’ levels. The impact of this policy is modelled on the ‘2012 cohort’ suggesting that this policy would see loan terms changed for existing borrowers. 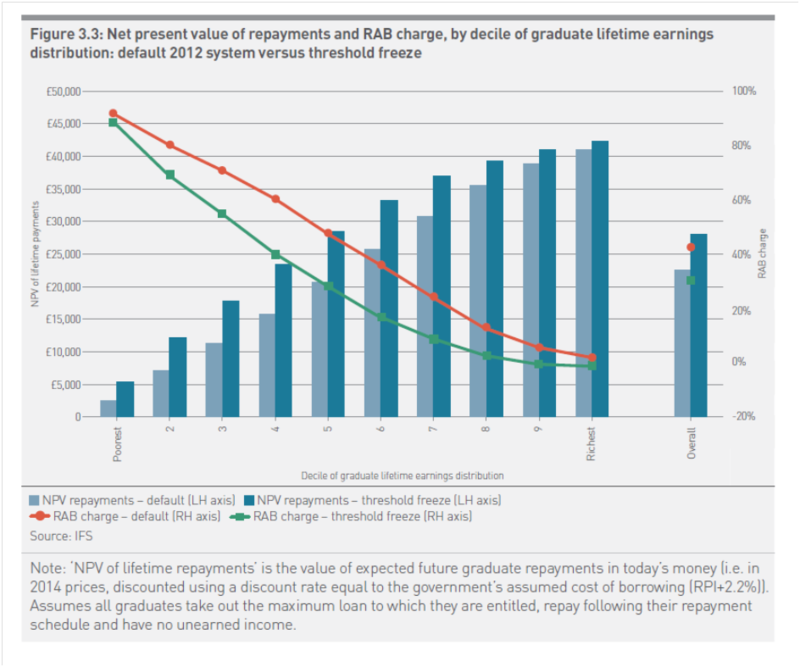 The panel suggests that this policy has several virtues, but the image below (taken from the report) shows how such a policy change would fall on the lower deciles in terms of a proportional increase in repayments (dark blue columns are lifetime repayments in NPV terms modelled for the proposals). The report repeatedly presents this proposal in the conditional: e.g. ‘If concern about the long-term costs to government of the loan subsidy increases in the short term, then some modifications to the system could be made’; ‘Were changes to become necessary’. This amounts to a disavowal of what the panel knows full well: that recent changes to the departmental budgeting specifically target reducing the RAB charge from the current official figure of 45-46% to 36%. BIS must find ways to reach that target or see year-on-year reductions to other spending, over and above the new £450million cuts announced for this year. For all the evidence gathered in the report, the panel don’t appear to have asked their focus groups or questionnaire respondents how they would feel about such retrospective changes to loan terms. There’s a risk here of serious damage to the public perception of universities and the HE system, that senior political figures and university management have not gauged properly. As an aside, a reader of the report might come away with the impression that the RAB charge is some kind of external performance indicator we use to measure HE funding systems. It may be ‘misleading to focus on the RAB charge as the most significant indicator of the impact of the reforms’, but (hint) people focus on that charge because it scores in departmental budgets and accounts and the volatility involved in its calculation has significant implications. In the 2013 Spending Round, £4.4billion was allocated to cover RAB for financial year 2015/16 before the recent deteriorations in projections were recognised. To cover the increase from 36% RAB to 45% at least an additional £1bn of resource is needed.